the UN in neighboring countries. c.1503 BC - c.1200 BC Part of the Egyptian Empire. c.1370 BC - c.1200 BC Hittites take control of northern Syria. c.730 BC - c.605 BC Part of of (Neo-) Assyrian Empire. c.605 BC - 539 BC Part of the (Neo-) Babylonian Empire. 539 BC - 332 BC Part of the Persian Empire. 332 BC - 323 BC Part of Macedonia under Alexander "the Great." 323 BC - 301 BC Part of (Antigonid) Kingdom of Macdonia. 301 BC - 198 BC Part of the (Ptolemaic) Kingdom of Egypt. 198 BC - 85 BC Part of the Seleucid Empire. 85 BC - 64 BC Kingdom of Nabatea rules Damascus. 64 BC - 36 BC Part of the Roman Republic. (nominally a vassal of Rome). 12 Aug 30 BC - 259 AD Part of the Roman Empire. 259 AD - 272 AD Part of the Palmyrene Empire. 272 AD - 359 BC Part of the Roman Empire. 17 Jan 395 - 634/37 Part of the Eastern Roman (Byzantine) Empire. 1077 - 1104 Part of the Seljuk (Seljuq) Empire. Antioch 1099-1268, Ruad Island 1299-26 Sep 1302). 1104 - 1154 Burid Emirs rule Damascus. 24 Jul 1148 - 29 Jul 1148 Crusader siege of Damascus during Second Crusade. 1154 - 1181 Zangid Atabegs rule Damascus. 1183 - Sep 1260 Part of Ayyubid Sultanate. 1 Mar 1260 Damascus sacked by the Mongols (Aleppo Jan 1260). 3 Sep 1260 - 24 Aug 1516 Part of Mameluke (Mamluk) Sultanate of Egypt. 24 Aug 1516 Part of the Ottoman Empire. Nov 1840, Antioch 28 Jul 1832). Jan 1841 Direct Ottoman rule restored. 1 Sep 1915 French occupy Ruad Island off Tartus. 30 Sep 1918 Independence declared (Syria). Aleppo on 25 Oct 1918. 25 Jul 1920 France occupies Damascus and Aleppo. 1 Sep 1920 State of Great Lebanon (part of French Syria). 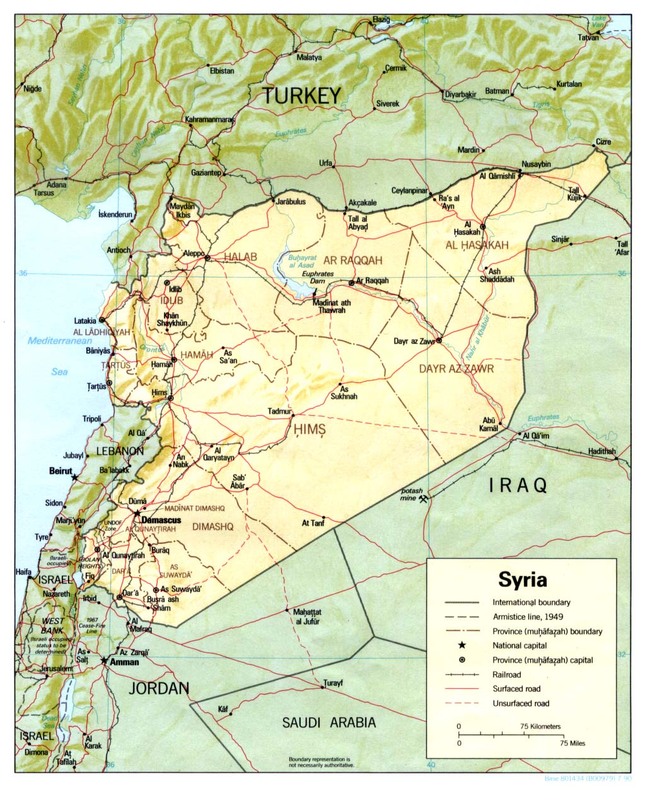 29 Sep 1923 - 1 Jan 1944 Syria a League of Nations Mandate under France. 1 Sep 1926 Lebanese Republic made a separate mandate. 23 Jul 1939 France cedes Hatay to Turkey. (from 21 Jun 1941, Free French). 21 Jun 1941 - 15 Apr 1946 Occupied by British and (Free) French troops. 1 Jan 1944 Independence from France declared. 17 Apr 1946 Independence recognized by France. 22 Feb 1958 - 28 Sep 1961 Part of United Arab Republic (see Egypt). by Israel 14 Dec 1981). ¹full style of the ruler 8 Mar 1918 - 28 Jul 1920: Malik Mamlakat Suriyya al-Muttahida; in French: Roi du Royaume-Uni de Syrie ("King of the United Kingdom of Syria"). Territorial Disputes: Golan Heights is Israeli-occupied with the almost 1,000-strong UN Disengagement Observer Force patrolling a buffer zone since 1964; lacking a treaty or other documentation describing the boundary, portions of the Lebanon-Syria boundary are unclear with several sections in dispute; since 2000, Lebanon has claimed Shab'a Farms in the Golan Heights; 2004 Agreement and pending demarcation settles border dispute with Jordan; Syria recognized the sovereignty of Lebanon on 14 Oct 2008; Syria did not surrender its irredentist claim to Hatay until 2005; The Tomb of Suleyman Shah is a sovereign exclave of Turkey situated within Syria's Aleppo governorate in accordance with the Ankara Agreement of 20 Oct 1921 (it is the burial place of Suleyman Shah grandfather of Osman I the founder of the Ottoman dynasty); the ongoing civil war had created nearly 2.8 million Syrian refugees - dispersed in Egypt, Iraq, Jordan, Lebanon, and Turkey - as of Feb 2014; dispute with Turkey concerning the Turkish occupation of parts of North Syria since Aug 2016. 13 Oct 2006 Declaration of an Islamic state in Iraq. [Afghanistan, Pakistan], the Caucasus, Somalia, and West Africa). Jan 2014 Seizes control of Ar-Raqqah, Jarablos, and Manbij. western Iraq (and Ramadi 12 May - 28 Dec 2015). 29 Jun 2014 Caliphate declared, renamed Islamic State. 18 May 2015 - 27 Mar 2016 Palmyra occupied. 27 Mar 2016 - 11 Dec 2016 Syria liberates Palmyra. 17 Apr 2016 Iraq re-occupies Tikrit (and Fallujah on 26 Jun 2016). 12 Aug 2016 Manbij liberated. 16 Oct 2016 Turkish-backed rebels capture the town of Dabiq. 11 Dec 2016 - 2 Mar 2017 Palmyra re-occupied. 2 Mar 2017 Syrian re-liberates Palmyra. c.May 2017 De facto capital moved to al-Mayadin. 12 May 2017 Syrian forces liberates Tabqa. 20 Jul 2017 Iraq liberates Mosul (begun 16 Oct 2016). 31 Aug 2017 Tal Afar liberated. 14 Oct 2017 Al-Mayadin is liberated. 17 Oct 2017 Ar-Raqqah is liberated (having begun 6 Jun 2017). 3 Nov 2017 Deir ez-Zor in Syria and al-Qa'im and Husaybah in Iraq are liberated. 11-19 Nov 2017 then liberated by the Syrian Army). 17 Nov 2017 Iraqi forces recapture Rawa, the last town held by ISIL in Iraq. driven the last remnants of Islamic State from Iraq. 17 Nov 2018 Syrian government retakes the southern area of Tulul al-Safa. 14 Dec 2018 Kurdish Syrian Democratic Forces forces seize Hajin. 15 Jan 2019 Al-Susah captured by Syrian Democratic Forces. 7 Feb 2019 Marashidah and nearby areas captured by Syrian Democratic Forces. organizations (inactive from Nov 2013). and parts of Aleppo governorate (Afrin and Ayn al-Arab [Kobanê]). are not recognized by Syrian government or Syrian opposition). 28 Dec 2016) as part of "democratic federal Syria." 18 Mar 2018 Turkey occupies the Afrin Region, Kurdish forces withdraw. on 17 Oct 2017) and Tabqa. 28 Jun 1922 Part of Union of Syrian States. 1 Dec 1924 Unification of Aleppo and Damascus. 1737/38 - 1740? Uthman Pasha? Mar 1773 - Jul 1774 Uthman Pasha al Wakil? 1 Jul 1922 - 1 Dec 1924 Part of Union of Syrian States. 5 Dec 1936 Incorporated into Syria. 1927 Renamed Jebel Druze (Djebel-Druze) State. 2 Dec 1936 Incorporated into Syria. 29 Sep 1918 British occupation of Quneitra. in the French Syria Mandate. 1 Jan 1944 Part of independent Syria. under UN Truce Supervision Organization (UNTSO) protection. 21 Sep 1956 El Auja demilitarized zone occupied by Israel. 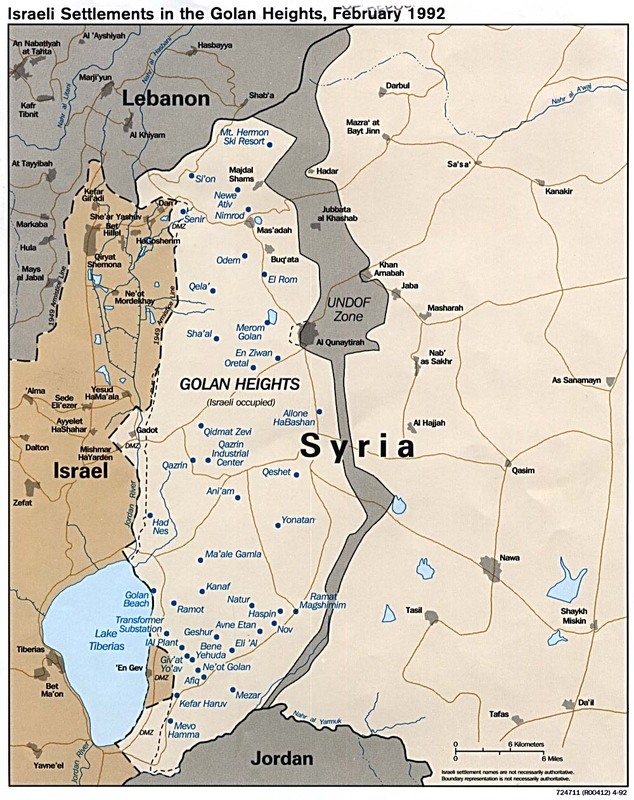 9/10 Jun 1967 Israel occupies the Golan Heights. 6 - 8 Oct 1973 Partial Syrian re-occupation. 1 Jun 1974 UN Disengagement Observer Force (UNDOF) mission established. 14 Dec 1981 Golan Heights annexed by Israel (not internationally recognized).